Our first day with no company and we found ourselves in a rut. We got groceries, cleaned up the yard, started laundry, and then were like “what now?” One of our worries before moving down here was moving away from our families, both of which lived within 10 minutes of us up north. They were a regular feature in our lives. Not to mention our friends. We were only slightly worried that we’d end up locked in never-ending staring contests out of boredom or, worse, retreat to separate corners of our what seems like cavernous home compared to our condo and barely speak to one another. Even in paradise, it’s easy to get stuck – get up, feed the cat, work, run errands, make dinner, repeat. Especially in a new place where our rhythms are so entirely up to us. So instead of our usual post-yard/house work MO of stripping down and floating in the pool, we decided to take the boat out even though the wind was blowing. You might wonder why wind blowing would be an issue for taking the boat out, well let me explain. Our family boat is a smallish v-haul craft designed to carry a max of 8 people across the shallow waters of the Florida Keys. As such, it is light – for skimming over 4-5 ft waters without running aground. This is generally an asset here – except when it is windy which makes the water choppy which makes driving this light, small boat feel like a contact-sport just trying to keep it from capsizing. Cruising the canals (pictured here) was the easy part. The canals block a lot of the wind and it is fun to see all the houses of my neighbors with their peculiarities. As soon as we hit open water, however, I was like “nope, we’re turning back.” Mr. Foodie wasn’t fazed by the swells and the bouncing around we did before I made that decision, but he is still learning how to handle boats. I myself am used to being driven in boats more than driving them, but I had no problems maneuvering, parking, passing, and finding the channel markers (she says with attempted humility, but in reality immensely impressed with herself). All that adrenaline and sunshine built up our appetites, so we showered off and got started on dinner for Italian night. I had originally planned to make this when we had company, but we went out to eat instead, so there is a LOT of food since it was designed for a crowd of hungry teens. Making meatballs by hand is one of those things that I grew up thinking was very difficult. Why take the time when you can just buy pre-cooked frozen ones and heat them up? Plus, there are so many different recipes for meatballs. How do you choose the one that will taste the best? How do you keep them juicy, but firm enough to stay together? An on and on. 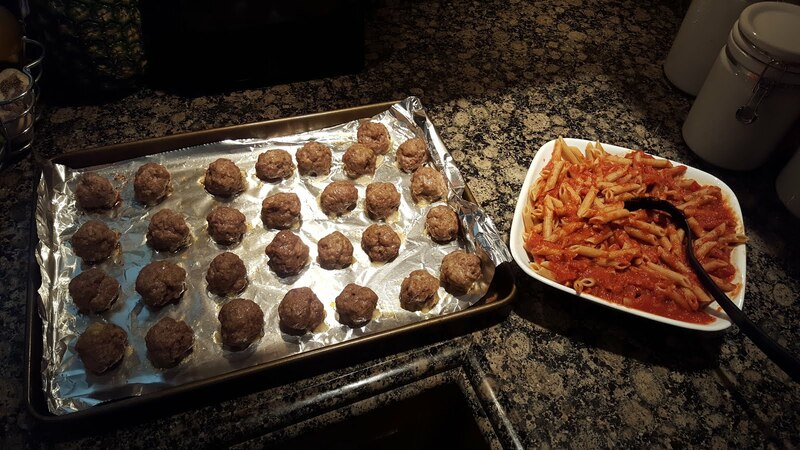 With the exception of my former grocery store’s frozen meatballs (god I miss Wegmans), I’ve turned a new leaf and now make them by hand more often than not. I like this because a) I can control what goes in them (processed food is just that no matter how tasty) and b) the base recipe is adaptable to change based on your desires or what’s left in your pantry. In this case, I had planned for very plain meatballs to satisfy some picky eaters, so that is what I’ll give you. Put all ingredients in a bowl and combine with fingers. Shape into evenly sized balls and place on tin foil-lined baking sheet. Bake at 350 for 20 min or so. When cool enough, pull off meatballs from tin foil with hands (don’t try a spatula or they’ll stick and you’ll lose the bottoms). A couple of notes: One of the major mistakes anyone makes when making meatballs by hand is over-mixing. Try to limit the amount of time you are mixing the ingredients so you don’t end up making dense little round versions of our grandma’s meatloaf. That is why the hands are….handy. Two, think carefully about moisture. If you want to add something to this like onions, diced tomatoes, garlic, roasted red peppers (a delicious option similar to our RRP burgers), then you’ll have to account for the extra moisture which might affect the cooking time and will impact the amount of breadcrumbs you should add to make the balls hold together. Finally, consider size. Make the balls even so they cook at the same rate, but also keep in mind that the bigger they are, the longer they’ll take to cook fully. Recipes differ immensely on what temperature to set it at (anything from 350-400) to how long to cook them, but a lot of that will depend on how big you make your balls and how your oven heats (for instance, my mother’s oven never reaches temperature, so we have to keep a thermometer inside to adjust the settings until it does). You’ll know when they’re done because the juices will run clear and be sizzling in the pan. Italian night is never complete without this recipe of Ina Garten’s. I happen to love zucchini, but Mr. Foodie is less keen, so it matters a great deal how I prepare it. Oddly enough, I am less keen on onions than your average foodie. I like the flavor, but not the crunch (especially of raw onions). So it is a miracle that we love this dish, but we do. Start out with two small or one large zucchini and slice evenly sized disks (if you don’t trust your knife skills, use a mandolin -those things are awesome, but for a small job like this I just use a knife). Cut the top and bottom off a small onion, peel the paper skin off, slice in half (from top to bottom), then lay the halves cut side down and slice the onion halves side to side instead of top to bottom. This will make little half-moons that you can break apart with your hands. I do this instead of a dice (although that’d be fine), because I like how the onions cook up this way and it’s pretty. 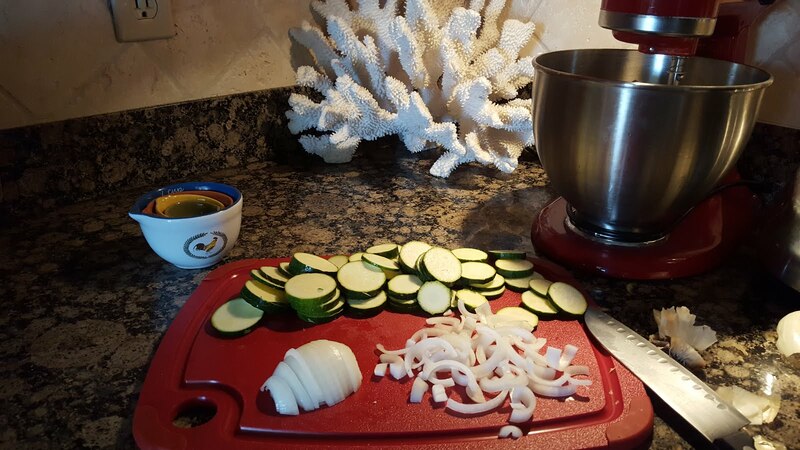 Depending on the size of your pan and the amount of zucchini/onions you have sliced, you will need to do two batches. The idea is not to “steam” the veggies in the pan, but to saute them. 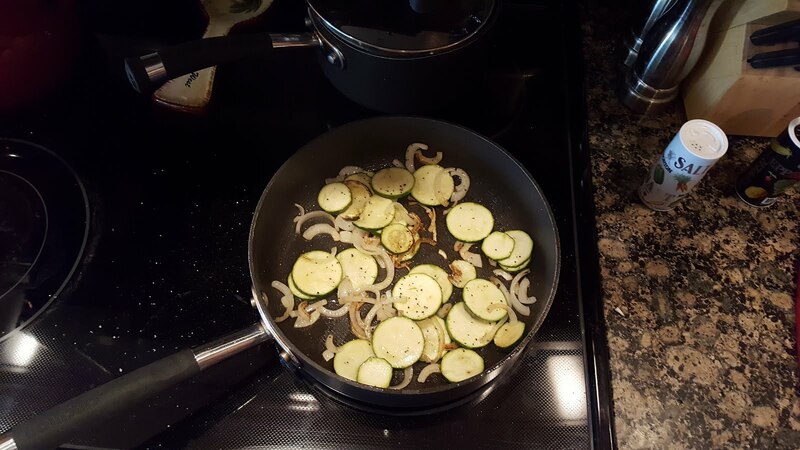 Start with some olive oil (a couple tablespoons), heat the pan, and then dump half the zucchini/onion mixture in. Salt and pepper it, spread it out on the bottom of the pan and let it cook on medium heat for a bit until you can see the onions becoming translucent. Use tongs to flip, move around, etc. until all sides are coated with oil and you can see browning happening on the pieces of zucchini. This should take around 5 minutes or so if you sliced your veggies thinly. Remove to a bowl or plate and cover lightly with tin foil while you do the second batch. Once you’re done, sprinkle Parmesan or any hard, salty, grated cheese over the top. Et Voila! Veggie perfection. I’m skating over the main thing that makes this dinner Italian because it is penne pasta cooked al dente with a store-bought fire-roasted tomato sauce. I often make my own sauce, but I love this brand and will use it in a pinch. To test the noodles for the perfect doneness, scoop one out of the pot and place it on the counter. For some reason, this whisks away the heat so you can pick it up and pop it in your mouth. Try to leave a little “bite” (al dente) so you don’t end up with pasta mush. When draining, reserve a little pasta water – the starch helps whatever sauce/cheese/etc you are serving it with stick to the noodles. When I use bottled sauce, I pour the sauce over the drained noodles, add the reserved pasta water to the empty sauce bottle, swirl it around, and then pour it on top -the effect is to add the starchy water to your pasta while getting all the last bits of sauce that stick to the jar when you pour it out. This dinner had Mr. Foodie contemplating thirds and sighing with pleasure – not bad for man who cares little for pasta dishes and zucchini. We talked about our boating adventure and then snuggled on the couch with a bowl of “lime” jell-o (a recent Mr. Foodie obsession). That’s Amore. Enjoy!